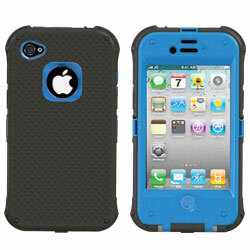 Hollywood, FL – August 9, 2011 – Now you can ensure your iPhone is protected from bumps, thumps, dust and water splashes. The NautiCase from Keystone ECO is a super tough iPhone case that provides three layers of protection to keep your phone safe. Think of it as body armor for the iPhone. The newest addition to the Keystone ECO line of iPhone covers features a high-impact polycarbonate hard shell with a clear protective film so users will have full access to the iPhone 4 touch screen without losing any phone functionality. The NautiCase offers a choice of six bright and bold color combinations and is equipped with a holster that keeps the phone face-in or face-out position. The holster also has a built-in viewing stand so the iPhone is easy to view while watching video. The NautiCase works with both AT&T and Verizon iPhone 4 versions in black or in white. The Keystone ECO NautiCase retails for $49.99. Florida-based Concord Keystone Trading, LLC and its sister companies, Urcovest, LLC, also located in Florida and Concord Keystone Trading Limited, located in Hong Kong, concentrate on developing, manufacturing, and distributing high-quality, low-cost imaging and other household convenience and portable power products. Urcovest and the Concord Companies market products under the following trademarks owned by Urcovest: Keystone ECO™, Easy Shot Clip™, Fun Shooter®, Concord®, Keystone®, and Easy Shot®; and the following trademarks licensed by Urcovest: Polaroid, 4U2ReUSE®, iPICKUP®, and iPICKUP2™. Unfortunately, I cannot find this case anywhere. Where is this sold? Is it still available? Is it sold at the link in the article, here: http://www.concordkeystone.com/ProductDetails.aspx?id=637 and it appears to still be available. Thanks.